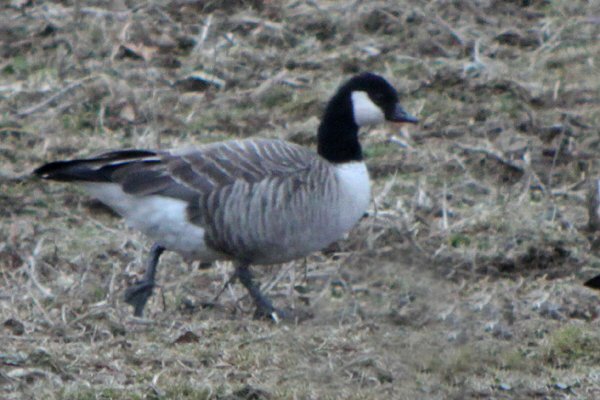 On Sunday, the same day that I enjoyed a bunch of winter birds in Sullivan County and Ulster County, I also had a chance encounter with a diminutive goose. It was on the side of the road in a field at Blue Chip Farm, a large horse farm near the town of Wallkill. But it wasn’t so easy as driving along, pulling over, spotting the bird, and driving on my merry way. No, finding a Cackling Goose takes a bit more work than that! What is a Cackling Goose? A Cackling Goose is a very small Canada Goose, or, at least, it used to be. In 2004, in a long anticipated decision, the American Ornithologists’ Union decided that the tiniest types of the Canada Goose were actually a completely separate species – the Cackling Goose, Branta hutchinsii. Birders everywhere suddenly had added incentive to search through giant flocks of Canada Geese which explains why when I saw a flock of about two hundred Canada Geese in a field at the side of the road at Blue Chip Farm I pulled over and started scoping through them hoping to find something good. And, sure enough, I found a cackler! How did I pick the one smaller goose out of the flock of bigger geese? I wasn’t looking at the birds’ body size as I scanned because Canada Geese, even those that are still considered Canada Geese, can be very variable in body size. What I was looking for was a bird with bright white cheeks. For whatever reason, Cackling Geese have cheeks that practically glow and as you scan through a flock of birds the cheek patch can really stand out if you are looking for it. Even once the geese I was scoping took off and flew into a small pond, joining a host of their closest geese-friends, making a flock of about 1,000 birds, I had no problem finding the Cackling Goose. Do you see that cheek patch glowing in the picture above? Of course, just having a bright white cheek does not make a goose a cackler. They should be very small, about the size of a Mallard, and have proportionally smaller bills. 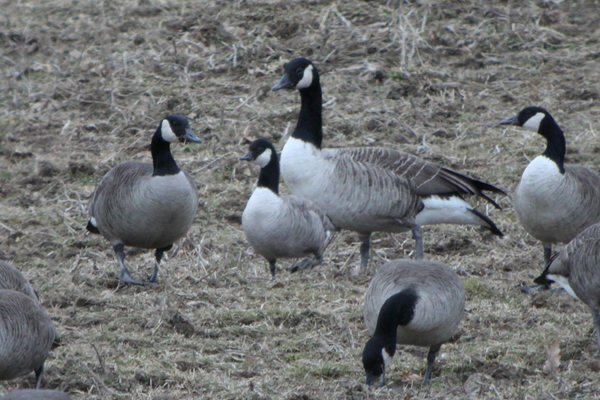 David Sibley has a great post that gives many of the finer points of Cackling Goose identification. 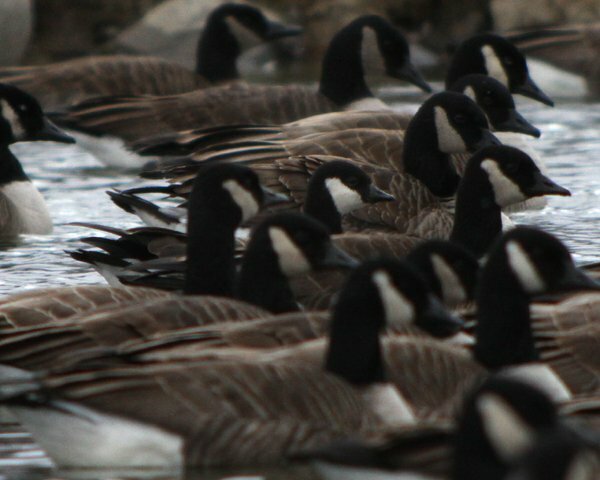 The main thing you need to do to find a Cackling Goose – or any other rare goose – is to be willing to search patiently through the flocks of Canada Geese that you find. It will make you a better birder and maybe, just maybe, you will be the lucky one who finds a bird like this or this. Even if you don’t you will see remarkable variety in the Canada Geese you find and will gain new appreciation for a very common bird. Now get out there and get looking for your Cackling Goose! Love these types of articles.. Very informative. I’m off to find some geese! That’s interesting. I wasn’t aware of the white cheeks. Does it work with all forms of Canada Goose? @Brian: Glad you liked it – good luck finding a good goose! @Jochen: All I know is that cacklers have really white cheeks. And, if all goes according to plan, Canada Geese will be split into 18 species and I will have seen them all! When is a Larid Not a Larus?